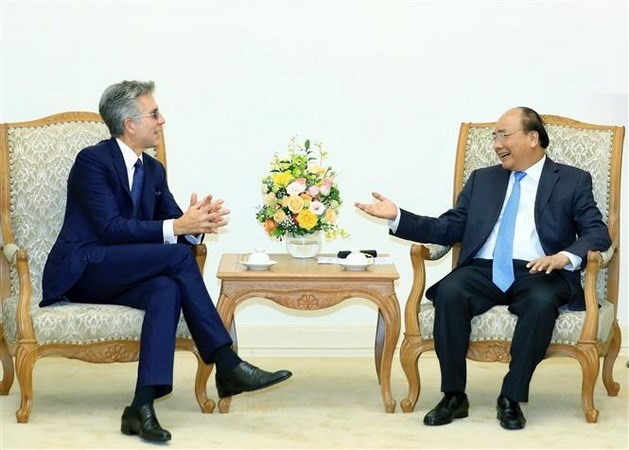 HÀ NỘI — Prime Minister Nguyễn Xuân Phúc expressed his hope that there will be more German businesses investing in Việt Nam, during a reception for CEO of SAP Group Bill McDermott in Hà Nội on Friday. At the meeting, PM Phúc lauded the contributions of SAP Group – one of the world’s biggest European software enterprises – to Việt Nam over the past 20 years, and pledged to create all possible conditions for the group to operate successfully. The Vietnamese Government has always attached great importance to consolidating and developing relations with Germany, as well as its individual states, he said, emphasising that Germany is Việt Nam’s most trustworthy and important partner in Europe. Phúc hopes that Việt Nam and Germany will step up their co-operation across many fields, especially in trade and investment. He said Việt Nam was on its path of digital reform and was one of the first countries to strongly support and anticipate the Fourth Industrial Revolution, as reflected in the country’s efforts to build new strategies and policies on digital transformation and the application of Industry 4.0. During the process, “Việt Nam welcomes the world’s leading groups and businesses to share their experience in relevant fields,” Phúc said. He lauded SAP Group’s digital government solution that had been applied successfully in several countries and suggested the group coordinate with the Ministry of Information and Communications (MoIT). The PM highlighted the project’s capacity to meet the demands for a growth-facilitating and transparent government which works to serve the people. Phúc also called for the German group’s support in building smart cities in Việt Nam, as well as for the digital transformation of a number of Vietnamese telecom businesses. “The Vietnamese Government is joining hands with the World Economic Forum (WEF) in building an information safety resource centre for ASEAN based in Việt Nam,” he said, appealing to SAP to support and send experts to help Việt Nam with the construction. “Việt Nam is ready to co-operate with and wishes to receive consultations from SAP in devising policies on start-ups,” the host said. For his part, McDermott said his group would like to co-operate with and contribute to creating marked changes, bringing a bright future to Việt Nam.